Gently cleans and removes makeup to leave your face soft and smooth with a hint of moisture. Water soluble for quick, effective action without adding oils to your skin. Suitable for morning and evening cleansing on normal, dry or combination skin. 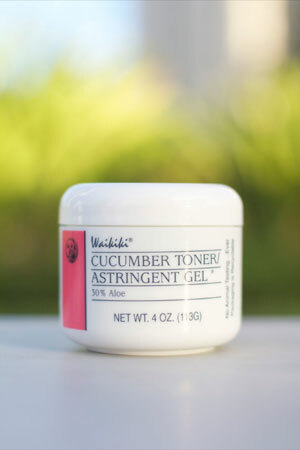 Cucumber Toner Astringent Gel - 4 oz. Tightens, refreshes, tones. This astringent gel is 30% Aloe to penetrate and moisturize delicate facial skin. Highly effective on all skin types after cleansing. 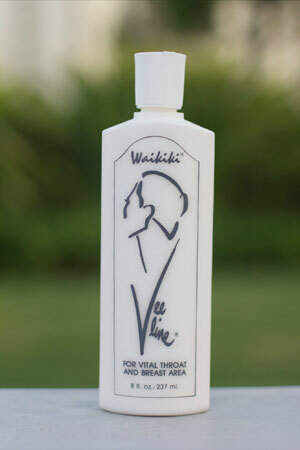 Designed for the vital throat and neck area. Extra skin conditioners with SPF10 UV protection and Collagen to protect and moisturize an area that is constantly exposed to the elements. Contains 40% Aloe. 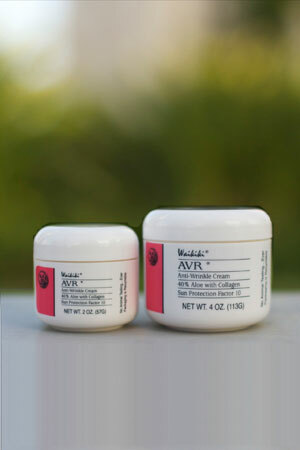 AVR means Aloe Vera Rich and this daytime moisturizer is a double-duty performer. It seals in moisture while it refreshes and smoothes facial tissue. The 40% pure Aloe content guarantees moisture delivery to bolster the Collagen and emollients. Contains an SPF10 UV protection. 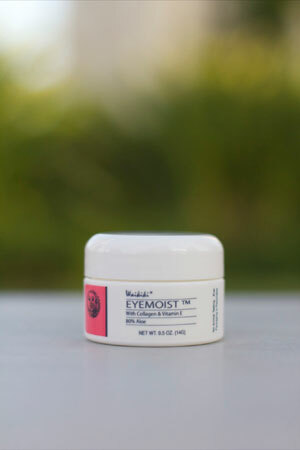 EyeMoist with Collagen and E - 0.5 oz. The perfect answer for that delicate skin area around the eyes. Fortified with Collagen, Vitamin E and 80% Aloe, this light moisturizer that glides on without effort, eliminates the look of tiny spidery lines that would diminish your eyes’ natural brilliance. Especially designed for Normal to Dry skin types, this night-time moisturizer eases away aging dryness while you sleep. 80% Aloe and Vitamin E work this overnight miracle. Greaseless Aloe moisture that won’t come between you and a good night kiss. Ideal for Normal to Oily skin types. Contains 80% Aloe. 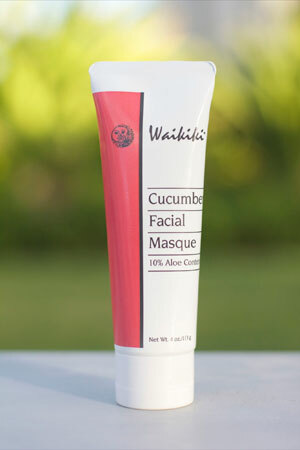 Cucumber Facial Masque - 4 oz. Serves as the basis of our deep cleansing program. It flushes away imbedded impurities, tightens pores, and improves facial tone. The unique combination of the Bentonite volcanic clay, soothing Cucumber and Aloe is the secret of this facial revitalizer. 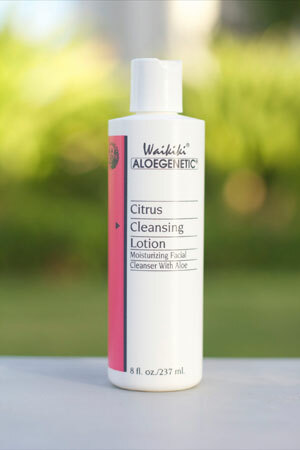 First, cleanse the skin with CITRUS CLEANSING LOTION and rinse off with water. Pat dry. Smooth on the mask liberally to face and neck. Lie down and put your feet higher than your head by putting pillows under your knees to feel the pulsation of your pressure system working. Leave on until dry, approximately 20-30 minutes. Rinse off with cool water, pat dry with a soft towel and apply a thin layer of CUCUMBER TONER/ASTRINGENT GEL. Repeat this process three times a week to normalize your skin type, and once a week thereafter to deep cleanse and maintain healthy skin. * For product details, click on any of the product names on the chart above. To normalize all skin types, use Cucumber Masque 3 times a week. After skin is normalized, use Cucumber Masque once a week to deep cleanse and maintain moisture balance.